I decided to get an early start to taking photographs this year so I headed over to the Minnehaha falls over the holidays. Usually the falls are completely frozen over by this time of the year but since the weather has been so warm this winter there was quite a bit of open water. Minnehaha Falls is a 53-foot waterfall located in South Minneapolis. 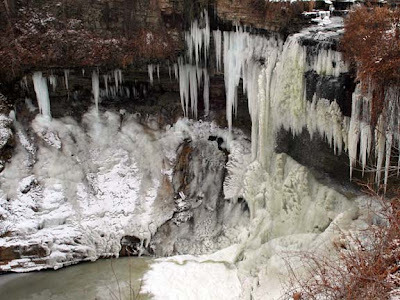 It is located on the Minnehaha Creek not far from where it empties into the Mississippi River. The creek begins at Lake Minnetonka west of the Twin Cities and winds 22 miles through Minneapolis and several south western suburbs before ending at the Mississippi. The falls is the centerpiece of the 193 acre Minnehaha Park. Typically access to the bottom of the falls is closed during the winter because the stairs leading down become filled with snow. 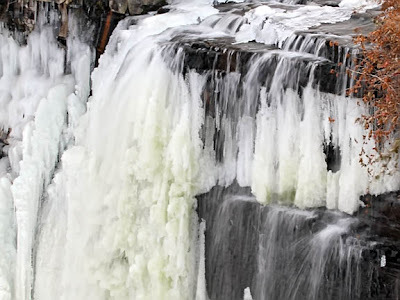 However since we have had very little snow fall so far this winter, and most of what did fall has melted, I was able to make it down to get down to the bottom of the falls to take some of these shots. Fantastic captures! 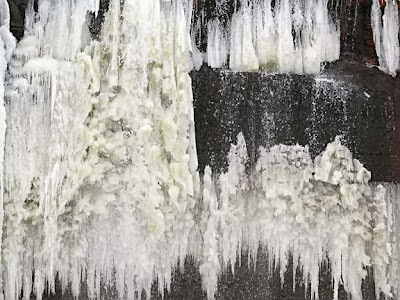 I love a chance to see waterfalls frozen! It happens sometimes at Snoqualmie Falls here in Washington, but not often! Hope your new year is off to a great start! Thanks for posting these amazing scenes! I've never seen a waterfalls in winter. I was once on the tour boat that goes past St. Anthony Falls. Awesome photos! I've never seen anything like this. My gosh....these images you've shared are incredible.